Nicky Knoff’s teaching is a bridge between Iyengar and Ashtanga Vinyasa Yoga; intelligent, anatomical alignment combined with linking internal energetic principles. Take advantage of this rare opportunity to learn from a vastly experienced senior teacher and book now for her week-long intensive in March. Ashtangi Master Nicky Knoff from Cairns will give several workshops at our Centre in March, including a five-day intensive from Monday 7 March to Friday 11 March 2016. 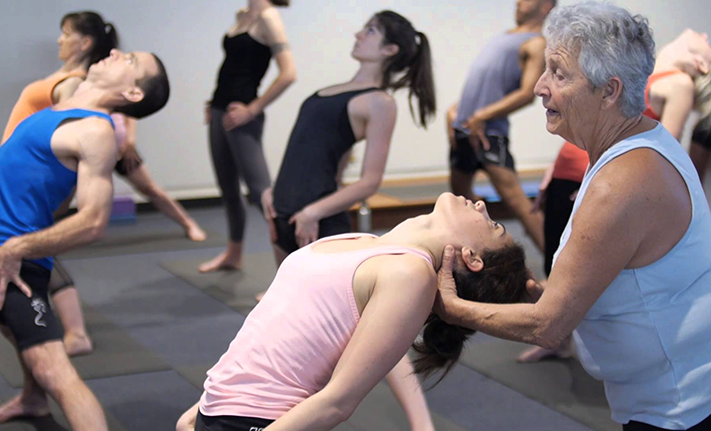 This is a wonderful opportunity to learn from Nicky, whose knowledge is distilled over 40 years of intense study and is considered by many as one of the true mothers of yoga. Nicky’s teaching focuses on showing students how to look, listen and feel by honouring their ‘inner wisdom’. Nicky Knoff will use the Foundation and Intermediate Teacher Training Asana, pranayama and meditation syllabus as the basis for this intensive 5-day workshop. Nicky’s free talk on Knoff Yoga’s 5 Pillars of Practice precedes the workshop above, starting at 6pm on Friday 4 March. It is expected to go for about two hours and everyone is welcome and sure to learn from hearing Nicky.